Founded in 2015 - FUSIONWRX was the new kid on the block when it came to marketing in the Greater Cincinnati area although the experience and capabilities that FUSIONWRX brought to the table were far from rookie status. FUSIONWRX is a marketing engagement and activation agency that specializes in guiding organizations to communicate their brand in memorable, engaging and highly personable ways so as to attract the right audiences and move them toward the organization’s core goals. Although FUSIONWRX was a new entity, it started with a foundation of 95 years of experience as a division of Flottman Company. The challenge at hand was to introduce FUSIONWRX to the masses and effectively communicate who we are, what we do and how we do it in order to gain interest and curiosity that would lead to new conversations with inherited clients from our parent company and potential clients about how we could improve their marketing strategy. We needed to increase business while showing our audience that we were able to practice what we preach and make an impact with the message/services that we were selling. Continuing the brand personality and tone of FUSIONWRX, we were direct and straight to the point, making a bold statement that demonstrated that we were ready to get our hands dirty, whatever it took, to produce measurable results for our clients and that we were willing to break away from the norm. Over the course of the month long campaign, we sent out multiple mail pieces and coordinating emails that had a call to action for the recipient to follow their personalized URL (pURL) and take a survey to learn their own marketing style, with the added benefit of getting a new pair of Marketing Socks! The pURL that was listed on each of the mailers/emails would direct recipients to a personalized landing page that included 3 short questions. These three questions would determine their marketing style while giving FUSIONWRX just enough insight and information to start a conversation/plan a meeting to discuss further opportunities. Dependent on the chosen answers, the audience was taken to one of the following results pages that showed a picture of their NEW marketing socks and had a description of their marketing style. The coordinating socks that matched the surveyor’s results were then shipped or hand delivered to each individual with a handwritten note and/or an accompanying phone call to setup a meeting. The socks themselves were also personalized with the recipient’s marketing style and FUSIONWRX branding printed on the tag of each pair. We custom designed and assembled 4 versions of the sock hang tag, to match the characteristics and style of each pair of socks. Socks were packaged in a custom box, with both campaign branding and FUSIONWRX branding on the outside, so the recipient would immediately connect the package with the survey that they took, building excitement before they even opened the box. 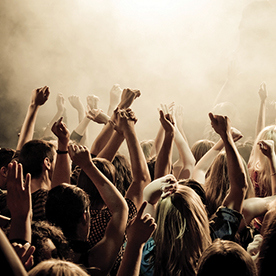 Our goal was to get in front of our prospective clients and make an impact that would generate a response. 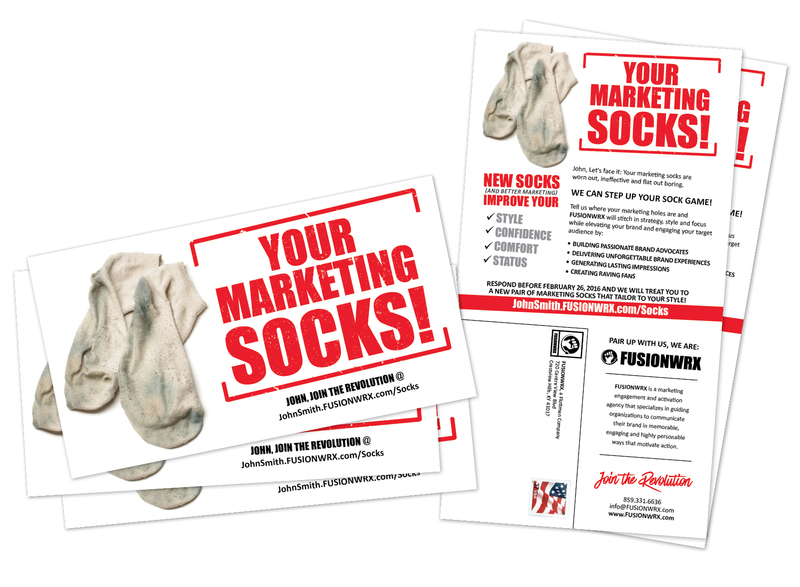 While we received very positive feedback, even those that were taken aback by what our bold message was insinuating – “YOUR MARKETING SOCKS!” – we are sure that they still saw our message and will not forget FUSIONWRX when they see our name again. If you or your organization would like more information on this campaign or want to know more about FUSIONWRX and how we can connect, engage and excite your followers, please contact us at info@fusionwrx.com! FUSIONWRX is a part of the Flottman family of companies. Since 1921 Flottman Company has provided exceptional service, originally as a print job shop to now a family of businesses serving marketing (FUSIONWRX), packaging (Rxperts Group) and miniature folded insert production. Flottman Company is one of the largest providers of miniature printing and miniature folding to the pharmaceutical, nutraceutical and medical device verticals. Visit Flottman Company and Rxperts online at www.FlottmanCo.com and www.RxpertsGroup.com.